Home Science Economics/ Fine Arts/ Physical Education. 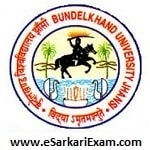 Eligible Candidates can Download BU Entrance Exam 2018 Admit Card at the Official Website of BU Jhansi. Applicants First Logon to BU Jhansi Official Website. Click on ET 2018 Admit Card Link. Fill Login Details & Click Download Admit Card Button.